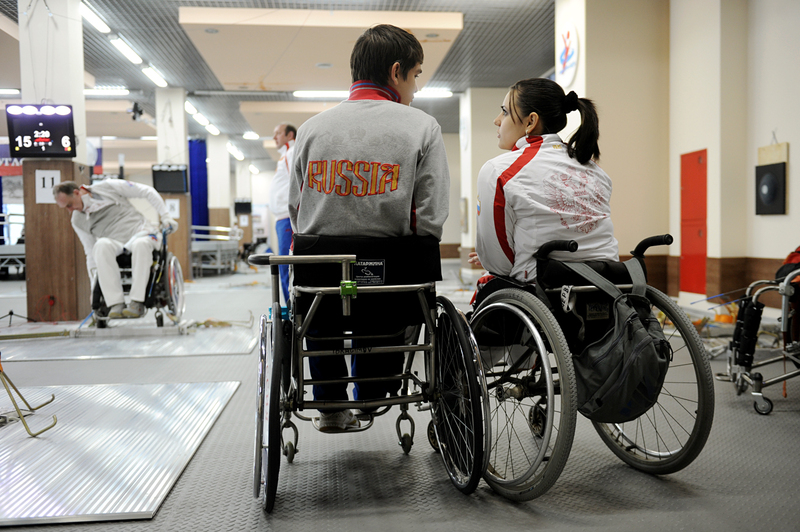 Paralympic fencers during competitions at the 7th Russian Championship of Wheelchair Fencing in a specialized room at the federal center for Russian national teams 'Round Lake' in Lobnya, Moscow Region. Russia works to settle the dispute with the International Paralympic Committee and to contest the blanket ban barring the Russian Paralympic team from the Rio Olympics. The Russian Paralympic Committee (RPC) is in talks with the International Paralympic Committee (IPC) on speeding up court procedures regarding the blanket ban of Russian Paralympians from their participation in the 2016 Rio Paralympics, RPC President Vladimir Lukin told TASS on August 9. "We are working on a mutual agreement with the International Paralympic Committee on the submission of a lawsuit with CAS (Court of Arbitration for Sport) to settle our dispute," Lukin said in an interview with TASS. "The lawsuit will be submitted against the International Paralympic Committee." "We are certainly interested for the court proceedings to begin as soon as possible, but it does not depend on us entirely," the RPC president said. "We currently work on the text of the lawsuit and hope to come to terms." Russia banned from Paralympics: What, when, why? Earlier in the day, Russian Sports Minister told TASS that the RPC should follow in the footsteps of the Russian Olympic Committee (ROC) in filing its response to the decision to bar Russian Paralympians from 2016 Rio. The IPC opened proceedings in regard to the RPC on July 22 after receiving from the World Anti-Doping Agency (WADA) a list of 35 Russian Paralympians, mentioned in the recent report of the Richard McLaren-led Independent Commission. Earlier in August, IPC chief Philip Craven said that ten more Russian Paralympians were suspected of violating anti-doping regulations. Based on the McLaren report WADA’s Executive Committee advised last month the International Olympic Committee, the International Paralympic Committee and all international sports federations to bar Russian athletes from all international competitions, including the 2016 Olympics and Paralympics. The IPC announced the introduction of the blanket ban for the Russian Paralympic team on August 7, barring it from the Paralympics in Brazil. Brazil’s Rio de Janeiro will be hosting the 2016 Summer Paralympics on September 7-18.